The plan for this newly built home called for two kitchens located next to one another, each with a distinct function. The kitchen in the main area was to be open and connected to all the living spaces as well as the outdoors. The “other” kitchen was designated the “summer” kitchen and was to be used for canning, baking and making preserves. Designer Gegg Design & Cabinetry designed the kitchens to be closely connected by two doorways, so the kitchens can share functions when necessary. The main kitchen was all about the views, interaction and entertaining with an open design including no upper cabinets and no tall appliances to obstruct the views. Along with the necessary appliances, the space also includes a stone wall with floating stainless-steel shelves and a custom island with open legs. 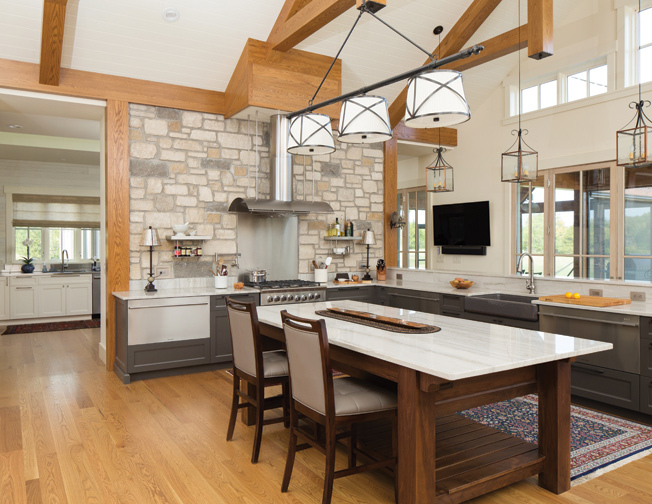 The island was inspired by a large furniture table the homeowner had seen in New Orleans and is made of walnut with simple legs that support a large open slat shelf with custom corbels that extend to support the counter overhang at each end. Most heavy cooking tasks are done in the “summer” kitchen, which is largely about function and is a workhorse space. The countertops are all stainless steel. The drawers are nearly all exposed frontless drawer boxes made from walnut with scope fronts for ease of use and limited visibility into the drawer contents. 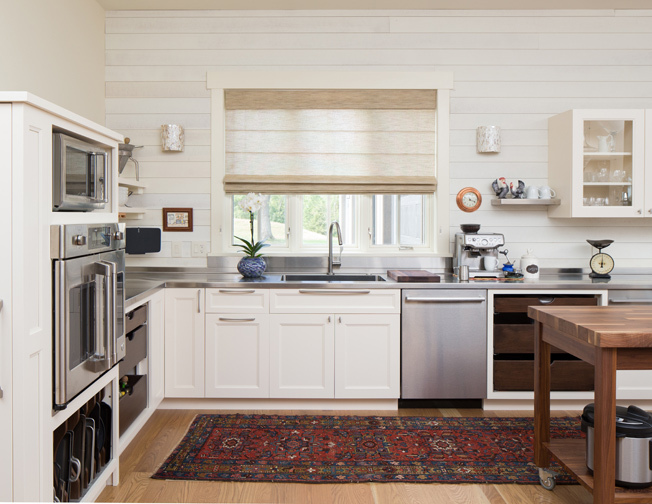 The walls are shiplap with an opaque finish, and most small appliances are left out since the kitchen is a workspace. Both kitchens function independent of one another. Combined, there is nothing they can’t do, but separate they are the best of both worlds. Wow! This space nailed it and is certainly not something you typically see in St. Louis. What a smart working space. We love the stainless-steel countertops in the “summer” kitchen. The designer was smart to keep the finishing panels around the top and side of the refrigerator from being too tall to create an open, airy feel.